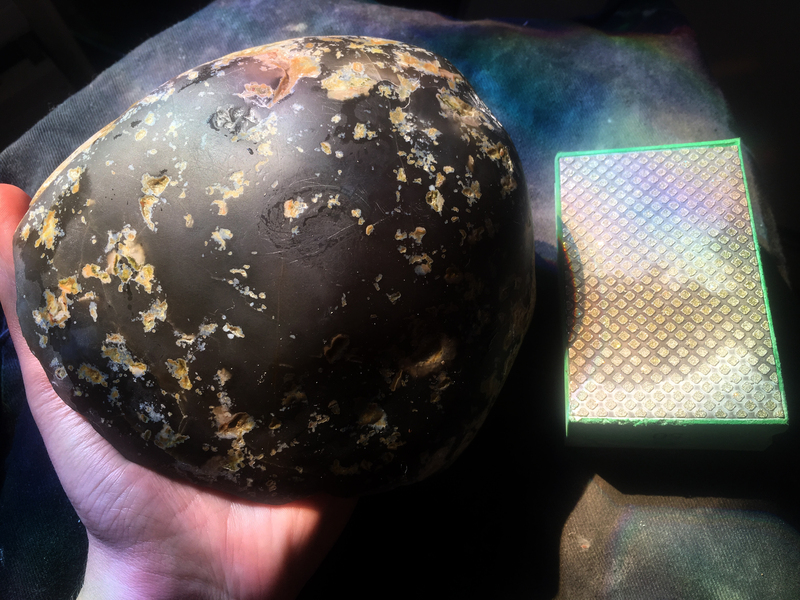 I have been sanding through an enhydro agate geode for over a year, slowly wearing away its surface toward the crystal-lined pool inside. It is part of a larger project exploring geodes through hand-sanding to examine things that usually go unseen. As I’ve approached the center of the geode, friends have been asking what I plan to do with the water. Let it spill? Save it? Drink it? Look at it under a microscope? Some people campaign to stop the destruction; one friend joked about petitioning me to save the geode. Not to “kill it” by breaking through to the center. What will I do if and when the water emerges? I didn’t know. I wrote to an expert, geologist Dr. Loretta Dickson, who has examined the water inside enhydro agates. 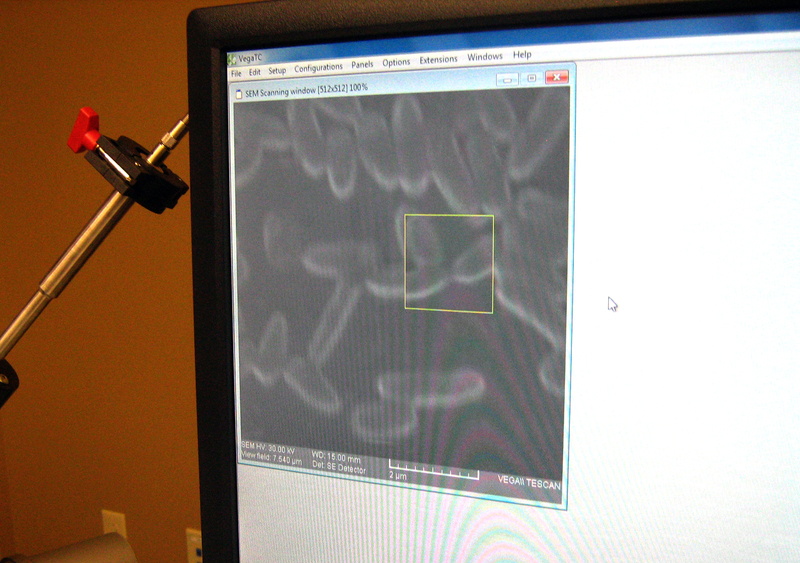 Dr. Dickson’s research, a collaboration with Dr. Joseph Calabrese, revealed microbial life inside an enhydro geode “in a state of near starvation” as is typical of microbes adapted to harsh conditions. I’d always felt as if the geode was alive, like a friend. But not, like, literally. I sent Dr. Dickson my previous geode posts from the past two years, and she expressed concern that I was planning on breaching the center void. They had done their experiments in a vacuum, drilling in and extracting the water with a sterile needle. If I broke through to the center, my geode would not only lose its unique quality of being full of water, but the microbes would die instantly upon being exposed to air. 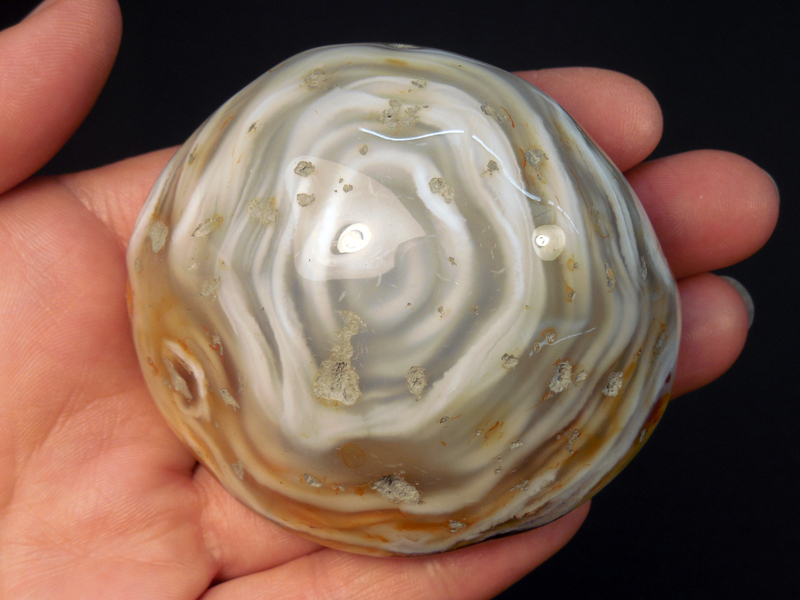 Dr. Loretta Dickson holds her “Cupid” agate geode. 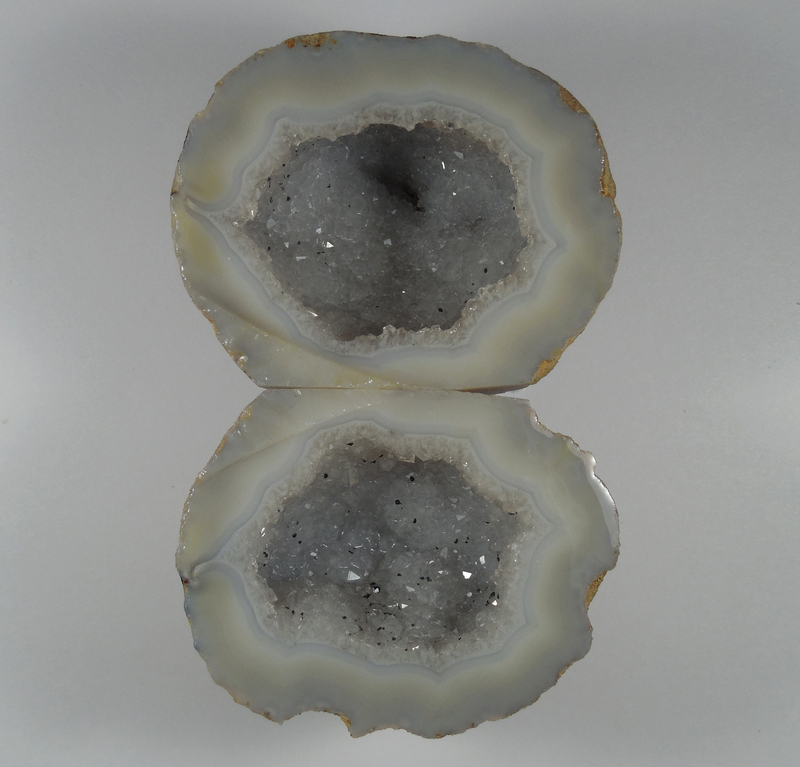 The geode is polished to just above the inner cavity so that the water is visible. Photo by Dr. Loretta Dickson. 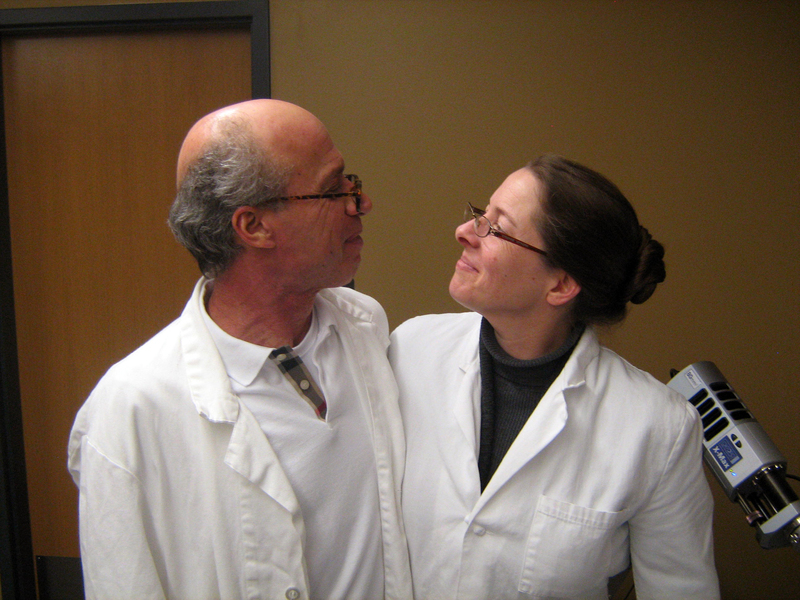 She sent some photos of the experiment: the sliced agate geode after sampling–not the “Cupid” agate, but one obtained for the lab–as well as a glimpse of the microbes and of herself and her now-husband Joe, Dr. Joseph Calabrese. 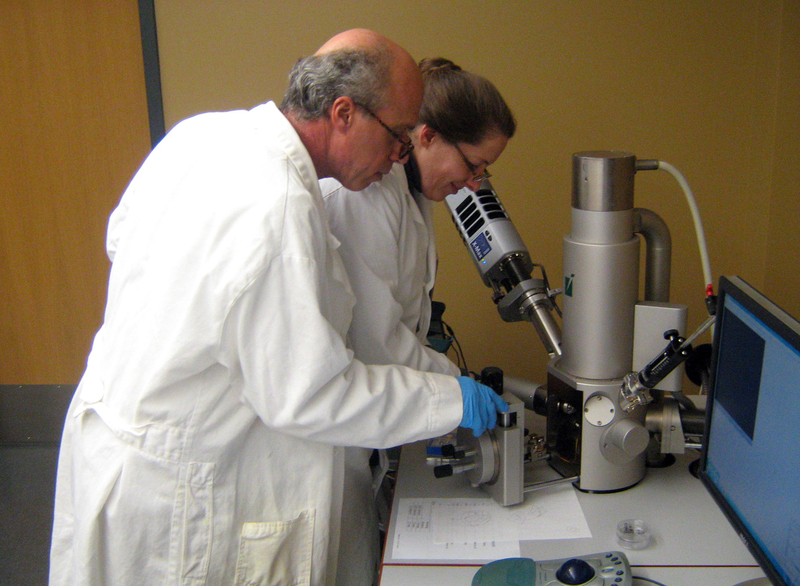 Dr. Dickson and Dr. Calabrese with the Tescan Scanning Electron Microscope housed in the Department of Geology and Physics, Lock Haven University. Photo Courtesy Dr. Loretta Dickson. A glimpse of microbial life inside an agate geode. Final images are awaiting publication and thus unreleased. Photo courtesy Dr. Loretta Dickson. Dr. Joe Calabrese and Dr. Loretta Dickson. Photo courtesy Dr. Loretta Dickson. I thought about how long these microbes had lived, and how powerful they were even in their deep sleep: dormant for millions of years, and then revitalized to make humans fall in love. Dr. Dickson advised me to polish the geode until the water was visible, then stop: a plan that keeps me on the path to a satisfying destination while keeping the geode–and its ancient inhabitants–alive. It’s as if I found her story through the labor-intensive process of heading toward the center of the geode, expecting something beautiful.